If you're of a certain vintage, you just thought of Alpha Bits. Remember that commercial? Once a year I buy a box of Alpha Bits. They're nasty little things that leave a puddle of sugar milk behind that my cats fight over. Every year, for the once a year I bought them, my ex-husband would laugh like hell as he went by and tell me I was 'the wizard of words'. He said it 7 times. I wrote in a column once that I usually only buy the boring cereals: Shreddies, Rice Krispies, Special K, Vector, and granola and oatmeal. Which is the truth. So of course some reader wrote to me to tell me I was eating pure crap, and that didn't I know that when I purchased any product that had 'cereal' listed as a main ingredient it was garbage? So I looked at my side to see if 'cereal' was the first ingredient listed, then realized I wasn't planning on being consumed, and if it were to happen to be by say, a bear or something, he probably wasn't going to be too terribly worried about my fillers and by-products. Sometimes I buy Corn Flakes, because my Dad used to. Do you know how bad Corn Flakes are? Before you can even put the milk back in the fridge, they've melted into little gummy flakes and you end up shoveling soggy pieces of flannel into your mouth. Every time I see a cereal that promises to stay crunchy in milk, I can only think of Chevy Chase and Christmas Vacation, and the shellack he invents for cereal. So I don't buy it. 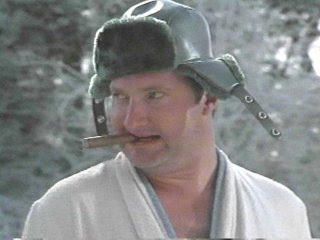 Then of course I have to think about the hat that Randy Quaid was wearing when he emptied his RV holding tank, and I laugh and laugh. I've mentioned it before: we call those sh*tter hats. Because he says he's emptying the sh*tter. Whenever I do a winter driving junket, we get one of those hats. And you know what? Nobody looks good in those hats. Nobody. Brad Pitt would look bad in that hat. Though he could come here and I could attempt to put it at a jauntier angle to help him look better. I wore one in James Bay earlier this year; we drove up there and it was 48 degrees below on the ice. You couldn't not wear that kind of hat. But you could certainly have not put my damned picture on the cover of the section, Mr. Editor. Sigh. Probably keep the bears away, though. Because you all think I only like cats, this is for the puppy people...from The Guardian. 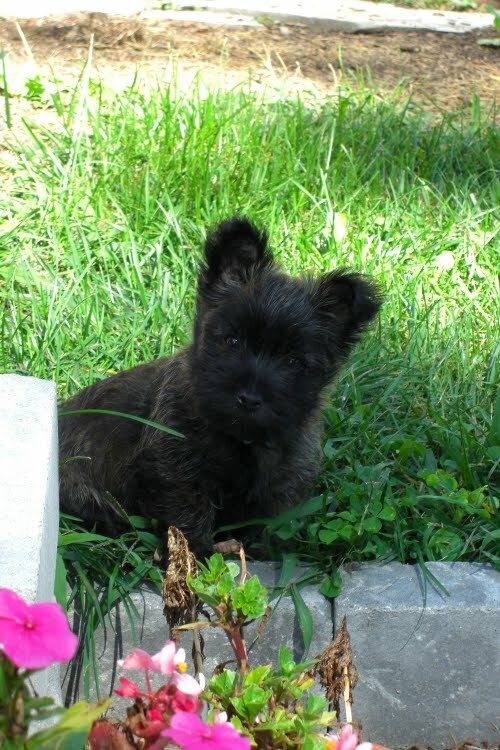 Oh, and my friends Roland and Pam got a new puppy. May I introduce Humphrey? Catch History Television tonight at 6pm. New series exploring how things get their names, and the first one up is about cars. I also did a Till Debt Do Us Part, that I think got totally canned. Never seen it. And no, I wasn't the debt person. I was the tell-her-what-to-do-with-that-car-she-can't-afford person. Edit: Here's the link if you want to watch on line. This show looks great. I'll definitely be watching each topic they tackle, not just the one on car names. My only stink? The myth that the Chevy Nova didn't sell well in South America because 'nova' translated into 'doesn't go'. Not true. Just when you think websites can't get any nastier than that one for married people looking to hook up someone not-their-spouse (Ashley Madison), there's another one where you can rat out anyone you like, real or imagined. Lovely. The internet is such a fascinating tool to use for broadening one's horizons, curing world hunger, or telling the world that guy you met on Match.com is a pig. Join us at 5:30 on CHCH, channel 11. Oh, and you might want to stick around for the news at 6pm. I've done a segment with health reporter Maria Hayes about being crazy, based on today's column.